Abiotic controls on net nitrification rates are well documented, but the potential effects of plants on this important ecosystem process are poorly understood. We evaluated four structural equation models to determine the relative importance of plant community composition, aboveground herbaceous production, and plant species richness on nitrifier abundance and net nitrification following restoration treatments in a ponderosa pine forest. Model selection criteria indicated that species richness was the best predictor of nitrifier abundance, but a model that included community composition effects also had some support in the data. Model results suggest that net nitrification was indirectly related to plant species richness via a positive relationship between species richness and nitrifier abundance. Community composition was indirectly related to nitrifier abundance through its relationship with species richness. Our model indicates that species-rich plant communities dominated by C3 graminoids and legumes are associated with soils that have high abundances of nitrifiers. This study highlights the complexity of deciphering effects of ecological treatments on a system response when multiple interacting factors are simultaneously affected. Our results suggest that plant diversity and composition can both respond to forest thinning, prescribed fire and fuel manipulations, and can be factors that might indirectly influence an ecosystem process such as nitrification. Ecological restoration treatments designed to increase plant diversity and alter community composition may have cascading effects on below-ground processes. Responsible Editor: Gerlinde De Deyn. 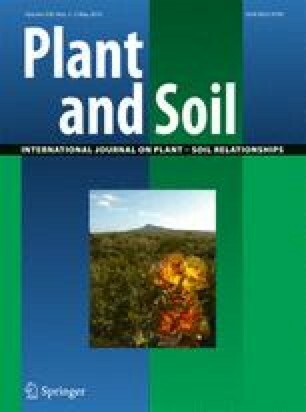 This manuscript was originally developed in the Northern Arizona University graduate course Advanced Topics in Ecosystem Ecology and Wildland Soils. We thank M.A. Bowker, G. S. Newman, and anonymous referees for their thoughtful reviews of the manuscript and W.W. Covington, P.Z. Fulé, and M.M. Luce for their contributions to this research project. Funding was provided by a National Science Foundation grant (DEB-9322706) and McIntire-Stennis appropriations to the NAU School of Forestry.